Preventive care visits such as general medical examinations, prenatal visits, and well-baby visits give physicians and other health professionals the opportunity to screen for diseases or conditions, as well as to promote healthy behaviors that may delay or prevent these conditions and reduce subsequent use of emergency or inpatient care. In an NCHS report, the rate of preventive care visits to office-based physicians is examined by state, patient demographics, and physician specialty. Estimates are based on data from the National Ambulatory Medical Care Survey, a nationally representative survey of visits to office-based physicians. 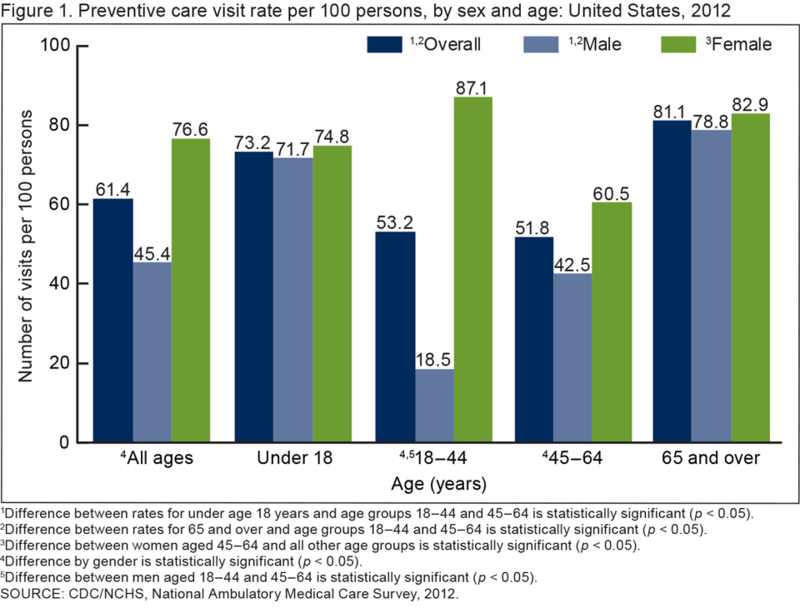 In 2012, 61.4 preventive care visits were made to office-based physicians per 100 persons. The female rate (76.6 visits per 100 females) exceeded the male rate (45.4 visits per 100 males) by 69%. Among the 34 most populous states, the rate of preventive care visits exceeded the national rate in 1 state (Connecticut) and was lower than the national rate in 11 states (Arkansas, Indiana, Iowa, Michigan, Missouri, North Carolina, Oklahoma, Oregon, Pennsylvania, South Carolina, and Washington). The rate of preventive care visits to primary care physicians in the 34 most populous states exceeded the national rate in 1 state (Connecticut) and was lower than the national rate in 7 states (Arkansas, Indiana, Iowa, Missouri, North Carolina, Pennsylvania, and Washington). From 2000 through 2010, the number of adults aged 85 and over in the United States rose 31%, from 4.2 million to 5.5 million, and in 2010, this age group represented almost 14% of the population aged 65 and over. It is estimated that by 2050, more than 21% of adults over age 65 will be aged 85 and over. Given this increase, adults aged 85 and over are likely to account for an increasing share of hospital utilization and costs in the coming years. An NCHS report describes hospitalizations for adults aged 85 and over with comparisons to adults aged 65–74 and 75–84. 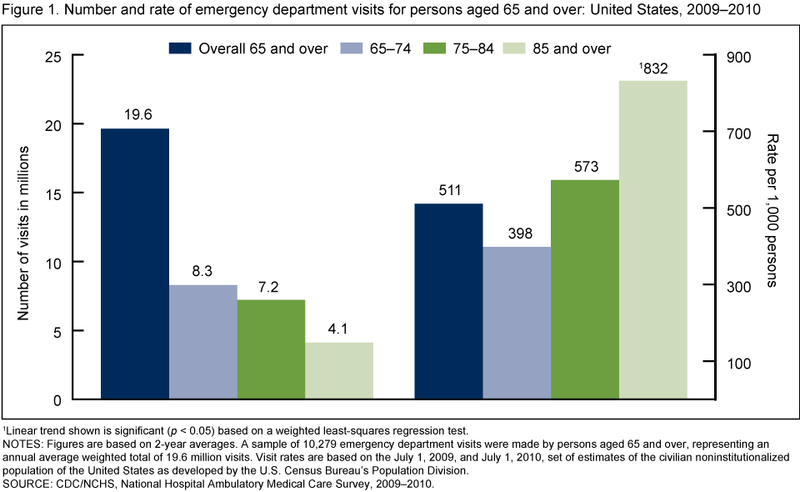 In 2010, adults aged 85 and over accounted for only 2% of the U.S. population but 9% of hospital discharges. From 2000 through 2010, the rate of hospitalizations for adults aged 85 and over declined from 605 to 553 hospitalizations per 1,000 population, a 9% decrease. 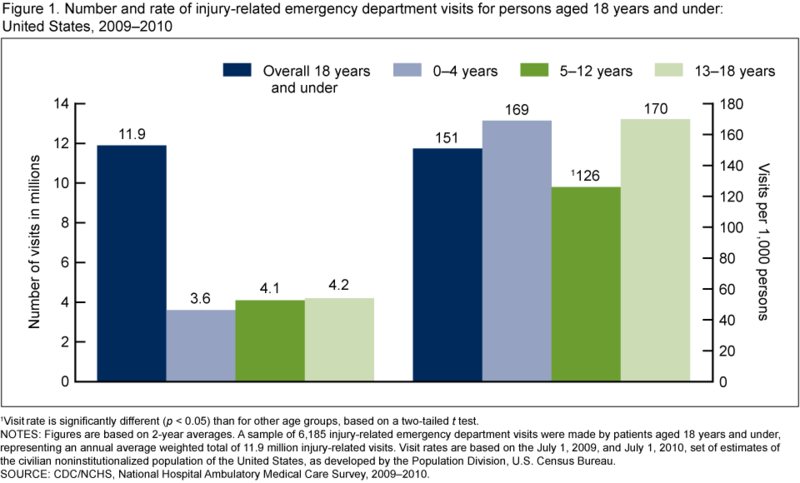 The rate of fractures and other injuries was higher for adults aged 85 and over (51 per 1,000 population) than for adults aged 65–74 (9 per 1,000 population) and 75–84 (23 per 1,000 population). Adults aged 85 and over were less likely than those aged 65–74 and 75–84 to be discharged home and more likely to die in the hospital. You are currently browsing the archives for the hospitalization category.